The Yankees' 245 homers are the most since Baltimore hit 253 in 2016. The Major League record is 264 homers by Seattle in 1997, and the Yankees are on pace for 263 HR. Andujar hit his 25th of the season to make it 1-0 in the second. They added to that lead later in the inning when Boston third baseman Eduardo Nunez couldn't come up with a groundball from Aaron Judge, and that made it 3-0. Voit hit a solo shot in the fourth to make it 4-0, and then a two-run shot in the sixth to make it 6-1. 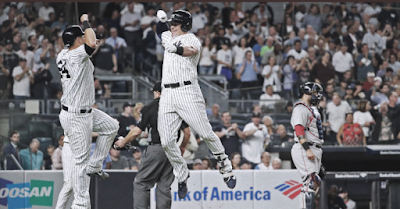 Voit now has 10 home runs overall this season, and nine since he joined the Yankees in late July. This was Voit's second two-homer game, as he also had two in a win at Baltimore on August 24. Since that date, he has nine home runs in 22 games, second most in the Majors behind Milwaukee's Christian Yelich with 10. Overall on Wednesday night, he went 4-for-4 with two homers, three RBI, and four runs scored. 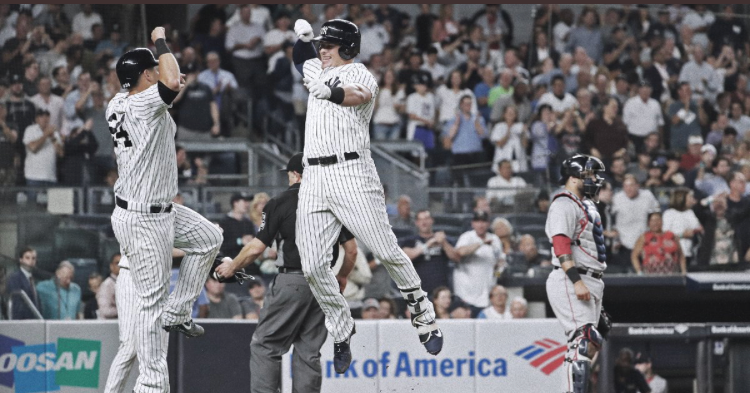 He is one of 10 Yankees with a multi-homer game this season, and the fourth Yankee with at least four hits and two home runs in a game, joining Brett Gardner (May 29 vs. Houston), Gary Sanchez (May 19 vs. Kansas City), and Didi Gregorius (the home opener on April 3 vs. Tampa Bay). Andujar finished 2-for-4, with the home run in the second and he had a double in the third. That put him in some vaunted company in Yankees history. Andujar is now the fourth Yankees rookie to hit 25 home runs in a season, joining Aaron Judge, who had 52 last season; Joe DiMaggio, 29 home runs in 1936; and Joe Gordon, 25 homers in 1938. In addition to the 25 homers, Andujar has 41 doubles and two triples to give him 68 extra-base hits this season, most among Major League rookies. DiMaggio is the only other Yankee rookie with at least 25 homers and 25 doubles in a season, as he had 44 doubles and 29 homers in 1936. Luis Severino had a great outing, as he went 7 innings, and allowed just 1 run on 6 hits and a walk with 6 strikeouts to earn his 18th win of the season. That is the most wins by a Yankees pitcher since CC Sabathia went 19-8 in 2011. Severino, with a record of 18-8, is now third in the Majors in wins behind Tampa Bay's Blake Snell, who is 20-5, and Cleveland's Corey Kluber, 19-7. In his last four starts at home against Boston, Severino has thrown 25-2/3 innings with a 1.05 ERA, allowing just 3 earned runs with 32 strikeouts and just 4 walks, per @ktsharp. Boston starter David Price had another tough outing against the Yankees, as he allowed 6 runs (4 earned) on 5 hits and 4 walks, with 2 strikeouts, in 5-1/3 innings. Price fell to 15-7, and this broke his 11-game unbeaten streak and his streak of 10 starts of allowing three-earned-runs-or-fewer. In four starts against the Yankees this season, Price is 0-3 with a 10.34 ERA (15.2 IP, 18 ER), and is 0-2 with a 12.46 ERA (8.2 IP, 12 ER) in two starts at Yankee Stadium. Since joining the Red Sox in 2016, Price is 0-6 with a 9.79 ERA (30.1 IP, 33 ER) in six starts at Yankee Stadium, and in 11 overall starts against the Yankees, he is 2-7 with a 7.71 ERA (58.1 IP, 50 ER). One of the Yankees top pitching prospects, Justus Sheffield, made his Major League debut when he came in to pitch the ninth inning. After Boston loaded the bases, he closed it out with a double play, bringing a big smile to his face. The Yankees (93-58) remain 2-1/2 games ahead of Oakland (91-61) for home field advantage in the Wild Card game, as Oakland beat the Angels 10-0.